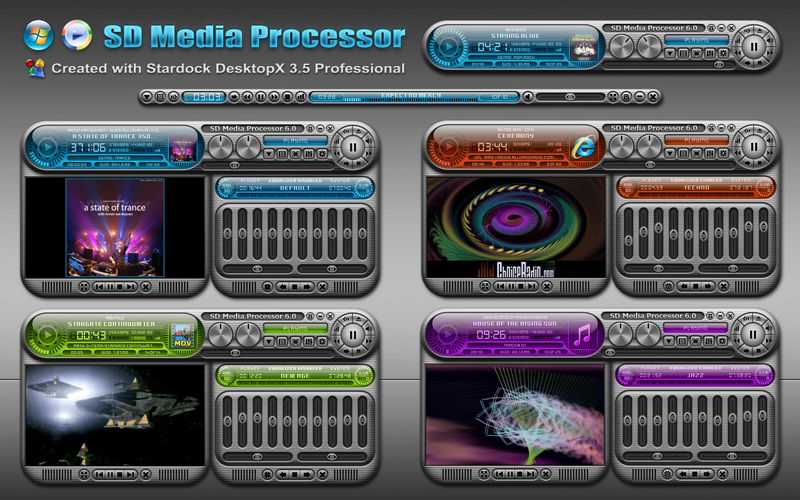 The next generation of SD Media Processor. Finally! *This player will allow you to play the most of known audio and video files. As well as Internet Radio. 1. How to extract the Album Art image directly from MPEG Audio Files (in *.png and *.jpg formats). 2. How to smooth the changes of current track position. 3. How to make the real time fade-in/fade-out effect for Player Sound. 4. How to integrate the elements of DX Player like equalizer into your script. *The project saved as a Widget (for testing) and as a Standalone Gadget (for using on computers that will not work correctly with DesktopX fade-in/fade-out). So you'll find two different files in the zip. How do I get the song title to show if I am using an internet station? Thanks. Nice work.. Always the same style but still nice work..
How do I get the song title to show if I am using an internet station? Player will extract and show this data automatically when you'll begin the playback. Just press the "Play" button. Always the same style but still nice work.. This is because I like Steel/Blue colors. As well I like coding so each of my widgets contains something new in their script. At the same time I don't see a sense to make new skins for any old widgets because their functions will be the same. Where is the progress in this case? This is an old widget? My bad..It just doesn't say update, sorry.. It shows the name of the station but not the song title. Please give me the link to radio channel you have tried to play and I'll correct this problem quickly (Certainly if this is the script bug...). Is there a repeat feature? I love your SD line of widgets! http://auralmoon.str3am.com:2025 The song titles do show up in iTunes, Winamp and Xion. Thanks. a great addition to the set. I tested it. Player doesn't show song title because the stream content is not organized as media playlist like *.asf, *.asx, etc... So its need to make a special code which will read html file and extract information about sound track. I'll try to make this.